Falcon Slant-Six road racer ! At an unofficial car cruise where tuners and racers sometimes gather, I met a gentleman with a very nice Ford in his trailer. 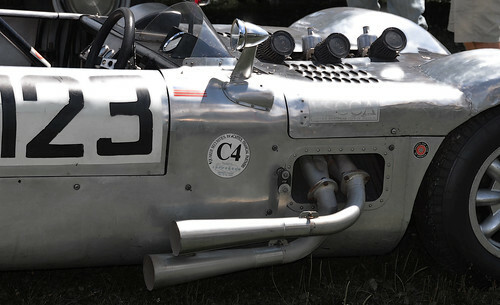 In his trailer was Shelby Cobra Daytona Coupe which he races along the East Coast. He called it a "Continuation Car" , which means it has an original Ford Factory Daytona frame but a later built body. He was interested in my Falcon Six performance projects and asked if I'd ever seen the "Philson Falcon". The "Philson Falcon" is a vintage road racer built in late 50's. The way it was explained , the builder Norbert Philson obtained a pre-production Falcon 144 six in 1959. Philson then laid the 144 over on it's side 30 degrees to lower CG. Oil pan and pickup were modded, cut off the intake and built a manifold for the SU carbs. The 1500 pound car has alum' body and tubular frame, Triumph and MGA suspension. It is currently campaigned in vintage races on the East coast, I hope to see it someday at NY's Limerock speedway . Re: Falcon Slant-Six road racer ! Very cool & unique. And to think it was built back in the 50's(late 50's..? ),and it's still used today . ~OO6.